Gears of War 3 Marcus Fenix Statue Figure. Condition is Used. Shipped with USPS Parcel Select Ground. The statue height measured at 11' The COG box is unopened and contains all the paperwork. And is almost 12" high, with an approx. 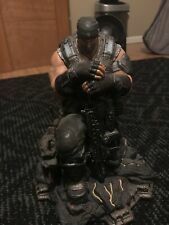 Marcus Fenix Statue - Gears of War 3 w/ Gun/Lancer & Extras Pre-Owned. Condition is Used The extra Marcus statue is a overseas “fake” of a Play Arts Kai Marcus statue. The cog holder shows signs of wear. Pictured. GEARS OF WAR 3 Marcus Fenix Figure Statue 11 inches . GEARS OF WAR 3 MARCUS FENIX FIGURINE STATUE, APPROXIMATELY 11 TO 12INCHES TALL. Gears of War 3 Marcus Fenix Statue Figure - 11" Tall. Condition is Used.I Lost the box. But in vgc. Gears of War 3 Marcus Fenix Statue from Epic Edition +Schwag! Marcus Fenix from Gears of War 3 Epic Edition. Gears Of War 3 Marcus Fenix Statue Figure. Condition is Used. Shipped with USPS First Class Package. Used for display. Adult owned. I also have the other items from Collectors Edition up for sale as well. Gears Of War 3 Marcus Fenix Figure Statue 11” Tall. Condition is Used. Shipped with USPS Priority Mail. Gears of War Marcus Fenix Statue From The GOW 3 EPIC Edition. It includes only the saute and EPIC Edition box. Gears of War 3 Marcus Fenix Statue Figure EpicGames Limited Edition 11"
Height measures 10 inches, with measures 8 3/4 inches. JaB I offer combined shipping, and all multiple orders over $50 shipped within the US, ships for free. All reasonable offers considered! Great Condition, Minor crack on the bottom of statue base plate but does not affect its stance. sits solid and firm. This is a great looking statue with great detail. This Statue will soon be a prized collectable which is already evident in the prices of this item which can ONLY be found preowned. Gears of War 3 Marcus Fenix Statue Figure. Condition is New. Still wrapped in a box that has seen better days never taken out never touched thanks! Gears Of War 3 Marcus Fenix Statue (Epic Edition) Brand New! These are in amazing shape. Marcus Fenix Platinum Mindzeye Statue - 44/1000. Dom Santiago Platinum Mindzeye Statue - 76/1000. And you also get a bonus Gears of War flag. Gears Of War 3 Limited Edition Marcus Fenix Statue 11" Tall Collector's Figure . Condition is very good Used condition. Shipped with either USPS Priority Mail or Parcel Post select. Your choice. Whew, here we go! 2009 SDCC Exclusive Gears of War Final Hope Variant Statues, a Marcus Fenix and a Dom Santiago, both blue. From Mindzeye Studios. Selling as set of 2. They were limited to 100 statues each. They are each marked with numbers on box (small faded white sticker) and markered on bottom of statues. Marcus is #49/100 and Dom is #68/100. They were taken out of boxes for display for a short time. Both statues in excellent condition, nothing broken or chipped or scratched on very close examination. Both boxes have slight handling/shipping wear (scratch or 2, a corner or 2 on each is a little crumpled in, wear can be seen in pics.) They were & are well loved and taken care of, hard to let go. In the original box ! All You see is the contents of the edition in the photo!